ATK's MegaFlex solar array is designed to provide more than 10 times more power than the largest current satellite array technology. WASHINGTON — ATK's Space Components Division of Goleta, Calif., will develop a large, low-mass solar array prototype under an 18-month contract from NASA's Space Technology Program valued at $6.4 million, the company announced Oct. 23. 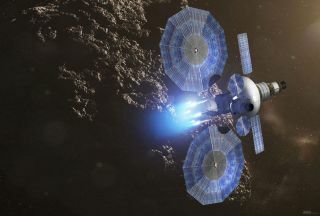 The MegaFlex array is designed ultimately for missions utilizing solar-electric propulsion requiring 350 or more kilowatts of power, the company said. The array will measure roughly 10 meters across when fully deployed but in addition to being lightweight features a low stowage volume, ATK said. MegaFlex builds upon ATK's smaller UltraFlex arrays that have flown on or are slated for several NASA missions, including a 2-meter-diameter version that powered the agency's Phoenix Mars lander. ATK is building 10 UltraFlex arrays for the Cygnus space station cargo capsule being developed by Orbital Sciences Corp. of Dulles, Va., and a 20-meter version will power for the Orion deep-space crew capsule being built by Denver-based Lockheed Martin Space Systems, ATK said. Under the Phase 1 Space Technology Program contract, ATK will build and test MegaFlex hardware to raise the technical readiness of the design, ATK said. The company hopes to develop a flight demonstration version under a future Phase 2 contract. NASA's Space Technology Program is designed to pursue technologies and concepts that could make it easier and cheaper to carry out the most challenging space exploration missions.